Steiner T5XI 3-15x50 Military Riflescope 5112 helps shooters to take accurate shots at precision rifle competitions.You can use this Steiner 5112 T5Xi 3-15X50 SCR Reticle Riflescope with both AR10 platforms and lightweight precision bolt guns. 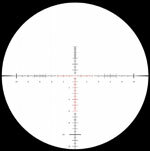 By using this riflescope, you ensure that you get stellar result in intermediate as well as long range precision shooting. Important features of this Steiner scope include constant eye relief, generous eye box, wide field of view, easy reset to zero, low profile turret system, tactile and audible clicks for adjustments, and many more. You never let go sight of the target with Steiner T5Xi 3-15x50 riflescope placed on your AR10 platform or lightweight precision bolt gun. Steiner 5112 T5Xi 3-15X50 Military Riflescope (SCR Reticle) to get better and more accurate result in intermediate to long range precision shooting. Field of View: 36.0 - 7.3' @ 100 yds. Eye Relief: 3.5" - 4.0"